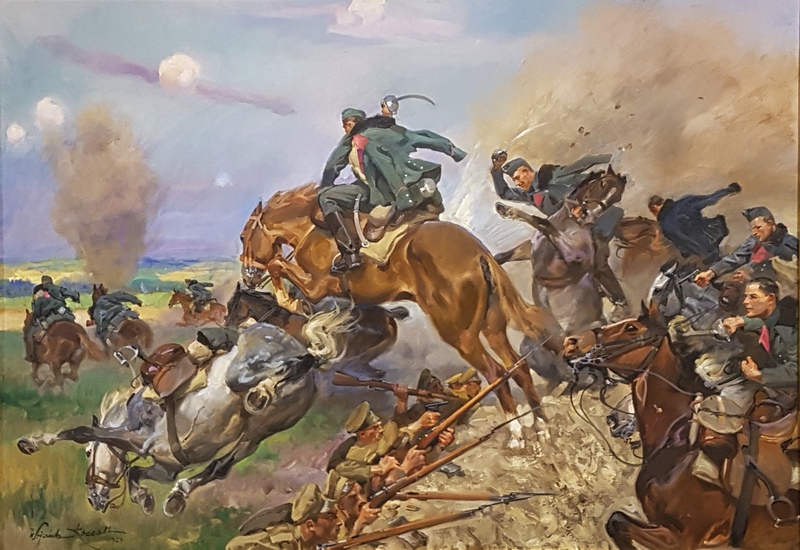 This spectacular painting commemorates the historical charge of the 2nd Brigade of the Polish Legions in the Austrian-Hungarian army against the Russian infantry. This battle took place near the the village of Rokitna on the eastern slopes of the Carpathians. In 1915 this area belonged to Austrian-Hungarian province of Bukovina, now this province belongs to Ukraine. The Polish won this battle in the First World War, but lost their commander and many other men. 19 years later Wojciech Kossak painted this scene on the basis of witness accounts. It is disconcerting to see the successful jump of a horse in the setting of a life-threatening battle of horses and sabres against rifles. We are so familiar with the show jumping sport that we can hardly realize that this ability of the horse was ever used for a completely different purpose. Wojciech Kossak pictured in 1934 what we, in our time, have learned through the movie “War Horse” by Steven Spielberg made in 2011, based on the novel by Michael Morpurgo from 1982.